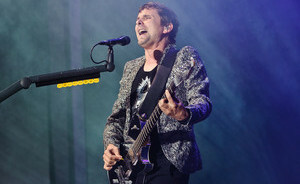 On June 9, Muse will release their seventh full-length, Drones, through Warner Bros. Records. The 12-track effort will act as a follow-up to 2012’s The 2nd Law. According to various sources, a teaser track titled “Psycho” will hit the web tomorrow, while the record’s lead single, “Dark Inside,” will arrive on March 23. In the meantime, you can view the album’s cover art and tracklist below.